Fixing the system won’t be easy. We can’t count on most of those those benefiting from the system to initiate needed changes but the authors provide a roadmap of how needed reforms can be accomplished. RAND asked a representative sample of Americans if they agreed with the statement “people like me don’t have any say about what the government does.” Responses among likely Democratic voters didn’t significantly correlate with support for either Sanders or Clinton. 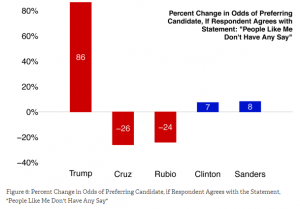 Likewise, there was no correlation with supporters of most Republican candidates… except Donald Trump. People who “somewhat” or “strongly” agreed with the statement were 86% more likely to prefer Trump over other candidates. “This increased preference for Trump,” RAND explains, “is over and beyond any preferences based on respondent gender, age, race/ethnicity, employment status, educational attainment, household income, attitudes towards Muslims, attitudes towards illegal immigrants, or attitudes towards Hispanics.” (June 26, 2016, Sociological Images) Desperate people are willing to take desperate actions, even voting for a megalomaniac. Who knows? Maybe it will work out better than the current situation, they may be thinking. Those voting for Brexit may have also agreed they have little say in what the European Union does. What about supporters of Islamic State of Iraq and the Levant? A person must feel powerless if they think their best option is to take such drastic measures. Who thinks they have a say over the direction of the financial system and corporate governance? Where are the levers for influencing mutual funds? Alienation might drive a lot of behaviors not explained by self-interest. What They Do With Your Money examines the financial system from the standpoint of an average person, explains why it isn’t working for us and, most importantly, provides solutions, including a Magna Carta for citizen investors. 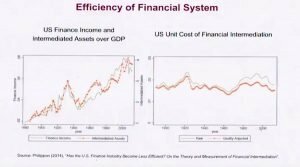 We can have a say in how the financial system is operated and whom it serves. Just don’t expect your bank, mutual fund or Congress to take the initiative in making it work for us. The authors of the book aren’t insightful unengaged scholars, observing the world from ivory towers. They are highly engaged individual citizens working to set up the institutional framework that will be required for transformation. Buy and read the book. Join us. Then they discuss the problem of incentives, among other causes of misalignment. Our capitalist system is supposed to be about those with capital deciding who will run our companies. However, we generally have so many intermediaries between investors and company managers, all taking a little slice of our money, that real monitoring goes by the wayside. We may invest a little in our 401(k) plan every month but how many are taking a little slice for administration? We pay record-keepers to check that our savings are going to the right place; mutual-fund managers and staff; third-party research firms and databases to help managers choose which stocks to buy; another set of advisors to help vote all those proxies; listing platforms so investments in the mutual fund can be bought and sold; brokers who handle the fund’s orders; transfer agents to look after those securities; agents to price them for reporting purposes; on and on and that doesn’t even touch on many of the more obscure aspects of our financial system, such as the fact that mutual fund are buying derivatives, not actual stock. All those small charges add up to reduce pensions of 25% to 40%. Most costs are hidden but the authors lift that veil. A real eye opener for me is that costs in the finance sector (generally around 1.5% – 2%) are the same as they were when the transcontinental railroad was built. Yes, there have been increases in productivity and efficiencies but those gains have gone to the industry itself, not investors. Financial sector income accounted for 4% of GDP in 1950 but 8% by 2010. While making up only 7% of the economy and creating a mere 4% of all jobs, the financial sector generates more than a fourth of corporate profits. (Makers and Takers: The Rise of Finance and the Fall of American Business) What other industry has done so little for its customers and is still thriving? Asset managers are typically compensated based on the amount of money they manage, not on how well they do with it. Similarly, loan originators were paid based on the number of loans, not their quality. The misaligned incentive helped bring on the Great Recession. I am reminded of a discussion I had with a friend’s father back in the early 1960s. As a consultant to Anheuser Busch, he got them to stop paying their sales force based on gallons sold. Instead, they were paid based on dollar volume. It was the birth of popular premium beers in America. How incentives are structured can make all the difference. The authors of What They Do With Your Money describe how similar disincentives apply to managers of mutual funds and corporations. For example, maximizing near-term share price, rather than intrinsic corporate value, leads to a raft of economic inefficiencies as well as lowered financial returns. It also incentivizes managers to externalize costs off onto the environment and taxpayers. Similar criticisms are levied at mainstream economics, which assumes away real world complications by treating people as economic robots in order to improve pseudo-precision. In mainstream economics if the model doesn’t fit reality, make reality fit the model. The answer is economics based in real people, accounting for their real values and actual behavior. Frequent readers of CorpGov.net will find much that is familiar in What They Do With Your Money. For example, the authors cite many of the same studies, such as that by Gilson and Gordon, The Agency Costs of Agency Capitalism: Activist Investors and the Revaluation of Governance Rights, which discusses why most mutual fund managers don’t monitor corporate governance. See my series on Agency Capitalism: Corrective Measures. Another important study we cite is Executive Superstars, Peer Groups and Overcompensation: Cause, Effect and Solution by Elson and Ferrere, documenting the lack of a robust market for CEOs. 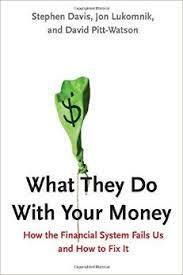 Like me, the authors of What They Do With Your Money offer a long list of practical solutions. Most, such as repealing IRS section 162(m), require collective action. Paying cash instead of restricted stock or options may make sense but lazy corporate boards and regulators can interpret a rise in stock value as a performance metric meeting the requirements of 162(m), whereas devising other performance measures to meet those requirements would take a modicum of work. Maybe if more directors were actually nominated by shareholders, they would be willing to put in the time effort and repeal of 162(m) would not be necessary. Trust must be built into the financial system by every intermediary assuming fiduciary responsibility, putting client interests before their own. Focus on good governance, rather than excessive rules. The first step in designing a twenty-first-century retirement plan is a capable, accountable and representative board. Give us the names and email addresses of all those intermediaries between us and our investments who are supposedly representing our interests. We want to be able to contact them to ensure they are acting on our behalf. Funds should be asking their investors what we want in terms of types of investments (I don’t want to invest in coal) or how to vote my proxy (I think most CEOs are paid far too much). Joining together with others through social media or an American equivalent of ShareAction is critical. We can’t transform the financial System on our own. I am hoping the authors will start such an organization. How about you? Are you ready to join… or maybe lead? I recently contributed a chapter to The Handbook of Board Governance: A Comprehensive Guide for Public, Private, and Not-for-Profit Board Members on The Individual’s Role in Driving Corporate Governance. Most of that book is aimed at corporate directors, managers and their advisors. However, several chapters, including mine, are relevant to the role of individual investors and how we can take personal responsibility for transforming corporations into more democratic institutions. Why should corporations be democratic-free zones? What The Do With Your Money and The Handbook of Board Governance have areas of overlap but each calls out unique perspectives and actionable solutions. Read both books and get involved.